There are several definitions for the word "bond." 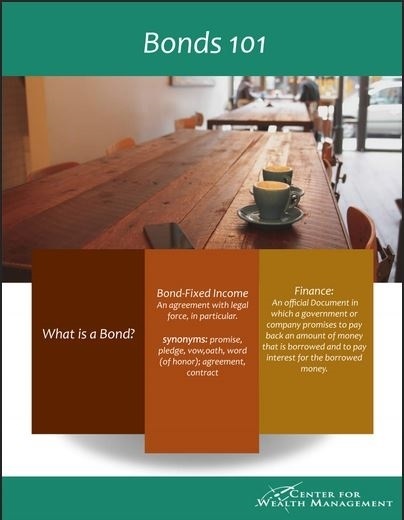 First, bonds can can be described as agreements with legal force. It is also considered a promise, a pledge, a vow, an oath, a word of honor, an agreement, or a contract. When it comes to the financial world, it can be described as an official document in which a government or company promises to pay back an amount of money that is borrowed. It is also understood that the borrower will be paying interest on the borrowed money. They are a form of debt. Often, local, county or state governments will use them to help pay for public projects. The federal government can issue them to help pay for its debt. They are like IOUs. Buying one means you are lending out your money and you expect to be paid back with interest. They are also called fixed-income securities because the cash flow from them is fixed. Stocks are equity; bonds are debt. The key reason to purchase one is to diversify your portfolio. The issuers are governments and corporations. They are characterized by their face value, coupon rate, maturity and issuer. Yield refers to the rate of return you receive. There is an inverse relationship between the price and the yield. When price goes up, yield goes down, and vice versa. There is also an inverse relationship between interest rates and price. When interest rates rise, their price in the market fall, and vice versa. A bill, note, and bond are each a fixed-income security classified by maturity. A Government bond is the safest form, followed by municipal and then corporate. They are not risk free. It’s always possible for the borrower to default on the debt payment. High-yield bonds are also known as junk bonds. Click here to find out more about Bonds or call us at (513) 407-5430.